The fourth fort along the Wall from the eastern side it guards the March Burn Valley to the west and as the ground drops to the east you will look toward Rudchester Burn. The fort has been excavated at least twice. In 1924 the principal buildings and gates were looked at and of the discoveries made this time the gates were of the usual type, four double and two single portals and the buildings were of the following: a granary, a hypercaust inside the praetorium and the principia along with its strongroom. In 1930 aerial photographs showed the following earthworks: the fort ditch and platform visible to the North, South and West along with Medieval and post Medieval ridge and furrow. In 1972 excavations in the South Eastern part of the fort revealed a burnt down barrack block dating to Hadrian’s era. This was built originally of stone and was replaced by a second barrack almost the same in design and build. This was erected in the late second or early third century but once it fell into ruin it seems it was not replaced a further time. The Headquarters building had been plastered at some time as this was found during the dig. The plaster showed signs of being coloured too. In the Mithraeum, which was excavated in 1924 and lies to the south-west of the fort, five altars were found. One of these alters was apparently left uninscribed and Rudchester Hall contains a unique fireplace inside as there is a stone lintel with carved jambs and, also, lying at the foot of the fireplace is a Roman Cohort and Centurial Stone which records the efforts of the Third Cohort of the Century of Pedovius and, it seems, was taken from the Wall itself. 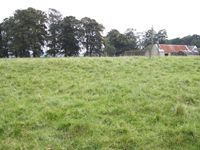 In late September 2010 my brother and I paid a visit to this fort and found only one stone visible above ground. 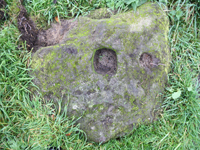 Two holes, definitely not natural, were found on top of the stone. One square hole measuring roughly four inches each side and a round hole at about two inches. Depths would be approximately three and 1.5 inches respectively. Unfortunately I did not have a measure to hand. By looking at the photograph on the lower right you can see how close these holes are. As yet I am unaware of their purpose but guesses which may be incorrect are best left. This stone was on the southern part of the fort and could have been, judging by the position of the stone, been used for one of the gates. The rest of the fort remains buried and the northern part of the fort is still actively ploughed. The west side shows the ditch as an earthwork as does the south. Some scarps actually survive up to 1.5 metres in height. I have attempted to show this in the photograph to the upper right. Hadrian cohors quingenaria equitata ?